Hidden in my Twitter ‘ticker tape’ feed was the weekly tweet I was waiting for! Their Burger Tuesday challenge started early March, pitting Chef Patricia Larkin’s weekly creation against the house regular, Richard’s 8oz Angus Burger – Smoked Bacon, Sharp Cheddar, Secret Sauce, Pomme Frites, Pickles & Truffle Mayo. I was sold! It was time to get off the sidelines and check out this burger competition. I knew the teenager would be game for some action. We went all Switzerland on them though and ordered one of each. They took their time preparing the meal to make sure every detail was calculated. It was worth the wait. In some ways, our toppings were quite similar, so no surprise that we were both very pleased. They offered medium doneness and it turned out to be the right call for my tastes. Still lots of juicy flavour between that bun. And let me tell you about that bun. It is not something I would typically be fixated on but hamburger buns can be tricky. You make them too soft and they go to mush before you can get very far into the assault. You engineer it to stand up to the burger’s moisture and it may be too chewy. This was a great bun. It held its own and still maintained pillowy, fresh softness. The buns are made especially for the Black Cat Bistro. No source revealed. I loved the bun! 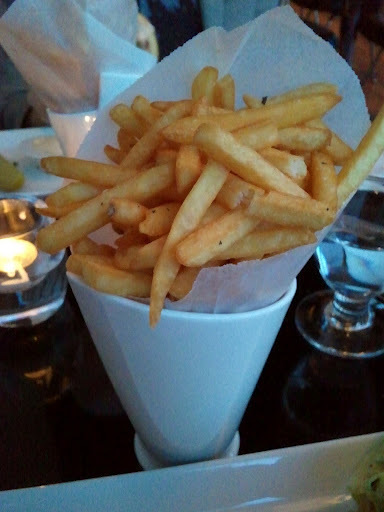 The dish comes with a substantial serving of their frites cooked in peanut oil, elegantly placed in a white ceramic frites holder. I even loved the blessed pickle. 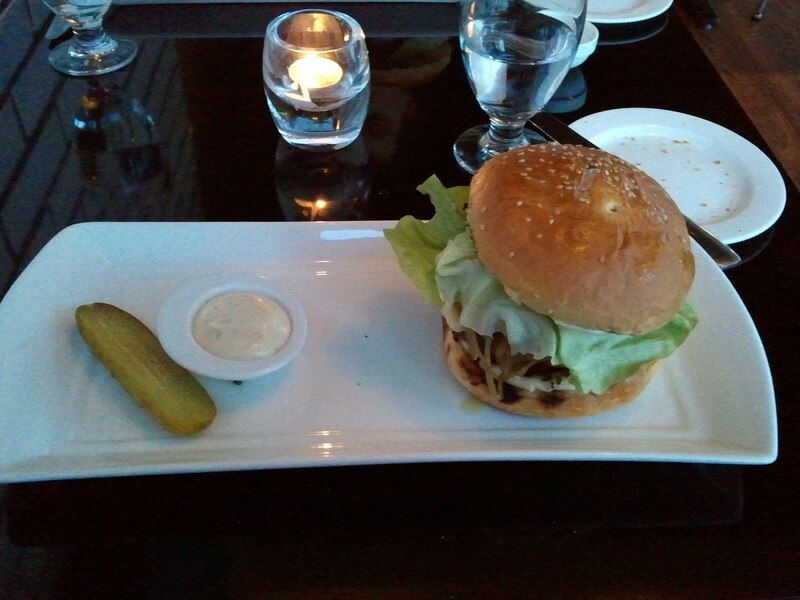 Whether you are taking the Tuesday burger or the Richard burger, both meals are priced at $20. Some might think that is a bit dear for burger night out, if they have ever ventured to another great burger place nearby called the Hintonburger. Both are great places and both have their niche. This is a bigger burger at 8 ounces! Plus truffle mayo for the frites. Truffle mayo! A pickle. A fantastically crunchy pickle. GREAT bun. Amped up toppings. Fresh, made in-house country wheat bread with maple butter to hold you over while your order goes to the kitchen. Guaranteed to be sitting. Table service. Regular top ups of fresh ice water. Warmth. Linen napkins. Stainless steel cutlery. Ambiance. 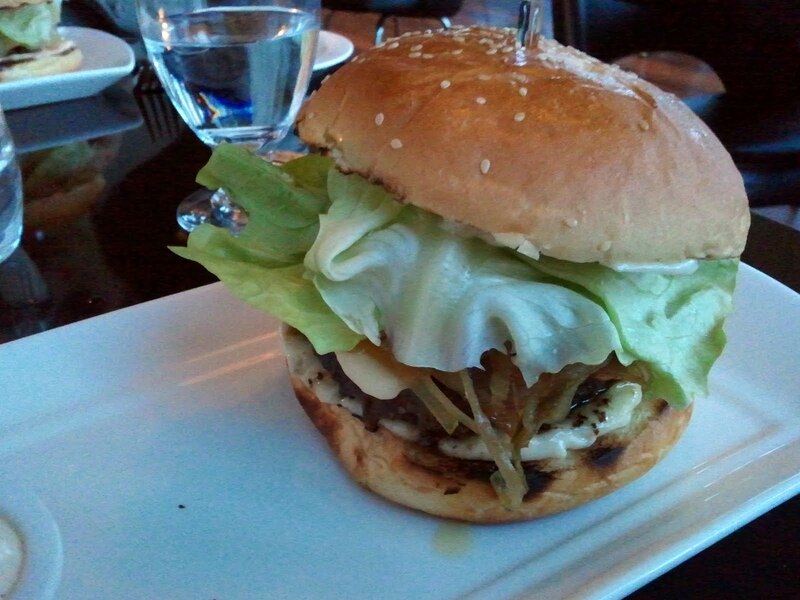 We were pleasantly surprised at how much we enjoyed our ‘fast food’ experience at BCB. No more sitting on the fence. From our vantage point, Burger Tuesdays are the cat’s meow. Well then, the main course hits and birthday girl’s husband whips out his camera to document the event. His meal and maybe hers. The mister and I followed suit with our phone cameras so they would have a full account of the evening. I find out that he loves to take pictures of their wonderful culinary experiences when dining out! But no plans to food blog it seems. But it opened the door for me to consider sharing the good news. I don’t have his pictures, as that was not the objective of their taking. I don’t even have the mister’s. The words of my account and the two shots I do have will have to carry the day. 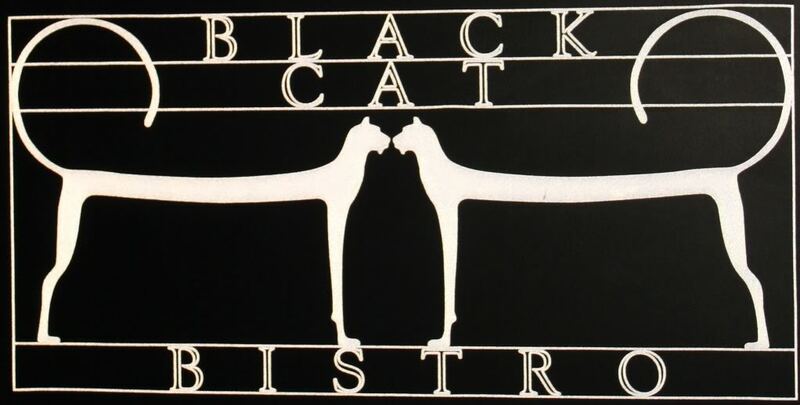 The Black Cat Bistro is a great place to celebrate anything. Within eye shot of us there was another birthday gathering of 10 or so people and then a girl’s night out of about 8! Lots and lots of ‘happy’ going on this night. Owner, Richard Urquart kindly greeted us when we arrived and gave us a spot near the corner of their long wall of windows that face both streets. I worry about being near windows in restaurants in the dead of January’s cold snap. Especially when you might be sitting for 2 or 3 hours. Richard had this place so toasty, that its winter comfort was noticeable. Thank you for a warm, cozy Black Cat Bistro on this night! I loved it. We all shared an Argentinian Altodecreo Melbac picked by birthday girl. I didn’t catch the year on the label but it was superb. And probably easily duplicated since I think there was only one selection of that kind on the menu. To tame the appetite, we were first served bread with butter. I think this may be the best bread I have ever had at a restaurant. (I know readers must hate reading ‘best ever’ in food blogs as it seems to lack imagination in detail, but this time I really mean it!) The right denseness, softness, chewiness. What a pleasant surprise! I wonder if I can return and just eat bread? (When I went home that night I knew I had to ask Chef Larkin about it, since I loved it so much. And so I hit the Internet airways to get a few details.) Indeed, the bread is baked in-house daily and the sweetness I tasted was the maple in the butter. Now on to the appetizers! I went with the full intention of having the Local Heirloom Beet Salad. And I stuck to my plan! It was dressed with Homemade Ricotta, Pinenuts, Basil & Sticky Balsamic dressing. The birthday girl warmed herself with the Winter Rutabaga Soup with Sour Cream and White Chocolate Espuma, Waupoos Cider Reduction and Gingersnaps. The two misters took the appetizer special. A pork terrine with a pork belly confit centre. Accompanied by many toasts, apple butter, gherkins and other delightful yummies. (I asked twice about it that night and still forgot. The power of having pictures for recall.) They both raved about it. Now on to the mains! 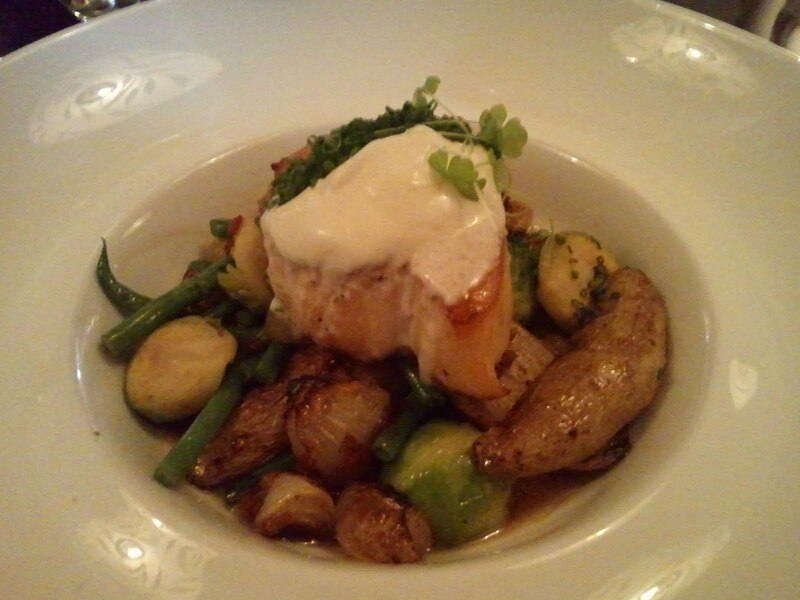 I had been craving seafood, so it was an easy choice to go for the Smoked and Pan-seared Escolar (a white fish from Equador) served with Fingerling Potatoes, Brussel Sprouts and Green Beans. The escolar was sourced from Whalesbone’s Sustainable Oyster & Fish Supply on Kent Street. The birthday girl went for a familiar favourite and chose the Seared Atlantic Scallops accompanied by Goat Cheese, Pickled Beets, Spaghetti Squash, Green Beans, Filberts and Vanilla Salt. My mister has a gutsy palette and chose the Brown Butter Sweetbreads with Butternut Squash Puree, Roasted Cipollini’s, Romanesco, King Mushrooms and Kale. Her mister took the French bistro classic – “The Black Cat Bistro Signature Steak Frites”. The Black Angus Striploin comes with Maitre D’Hotel Butter, Sage Seasoned Frites and Bordelaise Sauce. Dessert required some negotiation. Apparently there were only two servings remaining of the Classic French Lemon Tart. Of course, the birthday girl would have her pick. I considered it a good marital strategy to let the mister have the second. The birthday girl’s mister already had his sights set on the Carrot Bundt Cake. Served with Cream Cheese, Coconut, Rum Raisin Gelato and Pecans. 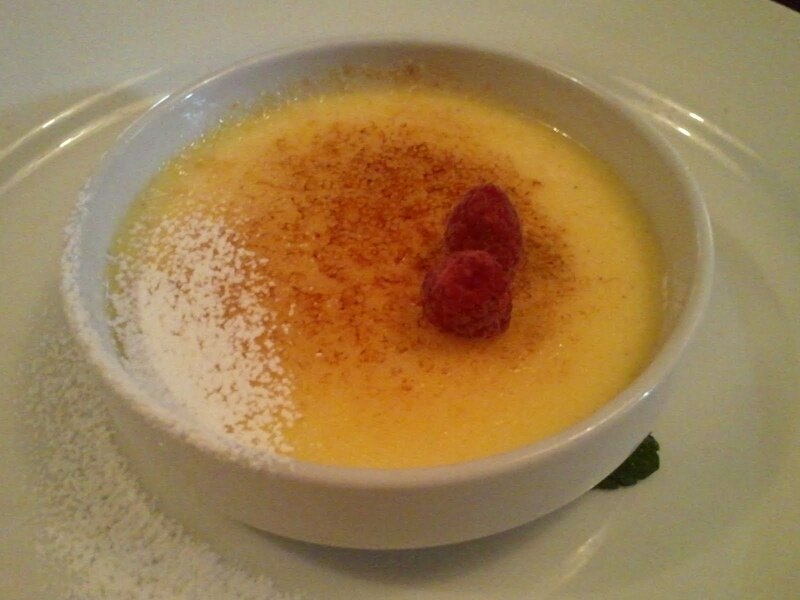 My backup plan to the lemon tart was to go for the Traditional Crème Brûlée made with Tahitian Vanilla and served with Seasonal Berries and Mint. Everyone was very pleased with their meals. The pace was just as we wanted it for a birthday dinner. The atmosphere so suitable for celebration. I love the decor, particularly the modern hanging light fixtures above the tables (check out their website). We were well looked after on service and appreciated the help in getting answers to our many questions. I had a chance to pop in to the kitchen to say hello and thank you to the very capable, Patricia Larkin. As their chef for almost a year now at the BCB, the buck stops with her. So reassuring to meet her and feel the vibe – oozing energy and cool as a cucumber. Now that is who I want in charge of my meal prep! It was nice to end our evening in conversation with Richard as we prepared our exit and reminisced about a night out that brought a special birthday to its close.